Habit: [Annual] perennial herb, subshrub [shrub], 20--50+ cm, pungently scented. Stem: erect, branched from base or throughout. Leaf: alternate to +- opposite [opposite], petioled or sessile; blades or lobes linear to oblanceolate or ovate, simple or 1-pinnately lobed, with +- bristle-tipped teeth, glabrous or +- minutely coarse-hairy to minutely scabrous, embedded oil-glands generally at bases of lobes or blade and near leaf tip. 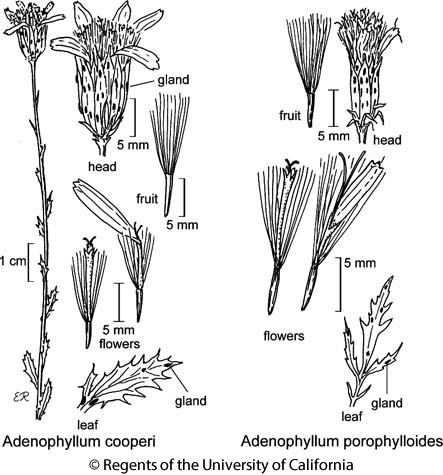 Inflorescence: heads generally radiate, 1, peduncled; bracts closely subtending head 12--22, linear to awl-shaped, sometimes 1--2-lobed, often bristle-tipped, generally with oil-glands; involucre bell-shaped to obconic [hemispheric], 7--20+ mm diam; phyllaries 12--20+ in +- 2 series, weakly fused 1/3--3/4 lengths, free in age, generally lanceolate to linear, persistent, margins of outer +- free to base, oil-glands on faces and near margins; receptacle convex, epaleate, +- pitted, margins of pits minutely fringed to bristly. Ray Flower: (0)7--14; corolla yellow to orange or red-orange. Disk Flower: 25--80[100+]; corolla yellow to yellow-orange, tube < cylindric throat, lobes lance-ovate to -linear; anther tip elliptic or ovate, acute; style tips linear, tapered, densely bristly. ; anther bases minutely sagittate. Fruit: obpyramidal [obconic], glabrous or +- strigose or silky-hairy, pappus of 8--20 scales in 1 series, each scale composed of 5--11 basally fused bristles. Habit: Plant 20--50+ cm. Leaf: blade 15--40 mm, pinnately lobed, glabrous, oil-glands at lobe bases and near leaf tip. Inflorescence: peduncle 2--8 cm; bracts closely subtending head 12--16, 3--8 mm, awl-shaped, glandular; involucre 10--15 mm, obconic; phyllaries 12--20, lanceolate. Ray Flower: 10--14; corolla yellow, becoming red-orange, tube 2--5 mm, ray 5--6 mm, 1--2 mm wide. Disk Flower: corolla 7--11 mm, yellow-orange or distally red. Fruit: 5 mm; pappus scales 7--12 mm, each composed of 7--11 basally fused bristles. Chromosomes: 2n=26. Citation for this treatment: Bruce G. Baldwin, adapted from Strother (2006) 2012, Adenophyllum porophylloides, in Jepson Flora Project (eds.) Jepson eFlora, http://ucjeps.berkeley.edu/eflora/eflora_display.php?tid=724, accessed on April 22, 2019.
e edge PR, s DMoj, DSon; Markers link to CCH specimen records. Yellow markers indicate records that may provide evidence for eFlora range revision or may have georeferencing or identification issues. Purple markers indicate specimens collected from a garden, greenhouse, or other non-wild location.